Ebay Now and few others in the US have launched same-day-delivery business models. There have been fanciful launches of services in the past, and a launch is NOT the same as success. So whether this works or not, the jury is still out. Here’s a story on the ebay Now model in the US. And I have seen the Peapods and the Webvans which struggled (not just with same day delivery but with the general business model that they took on) and failed. And I have a sense that these same-day-delivery models are also unlikely to win. I hear that Flipkart is also gunning to start these in India, and I see challenges in the same. It cannot be economical. Earlier traditional models of delivery of such kinds, got challenged on economics, and gave up. Bundled, slightly longer delivery schedules to get some economies of scale (rather than deliver your one package, can deliver 4 in your area, once in 3 days?). So don’t know how this current trend can sustain. It is not scalable. You may end up needing warehouses at various locations, and then a network at each of these. You’re competing with the local kirana, local vegetable vendor, etc. who will deliver anyway. You’re spoiling the customer. Most times, he doesn’t need it same day anyway. To get your edge over your competitors, you’ll do this, after a while find it hard to sustain, then drop it. Customers will feel let down. Curse you for withdrawing. You’ll burn some money for the 6-12 months that you will attempt to do this. Customers are not going to pay a huge premium to get this. So all the local warehousing, and the set up of the network, and absorbing some of the cost to acquire a few fussy customers. Will all go waste. As withdraw it, you will, in time. Meanwhile, it is an interesting story to get the buzz to happen..for ebay Now there, and soon for Flipkart, here.. Besides the variety of other differences that one may find in business plans and business models, one crucial difference between business plans is what I am discussing here. I come across business plans that involve a few years of building out. Maybe it is a prototype, maybe there is R&D effort, maybe the big software piece needs to get done. 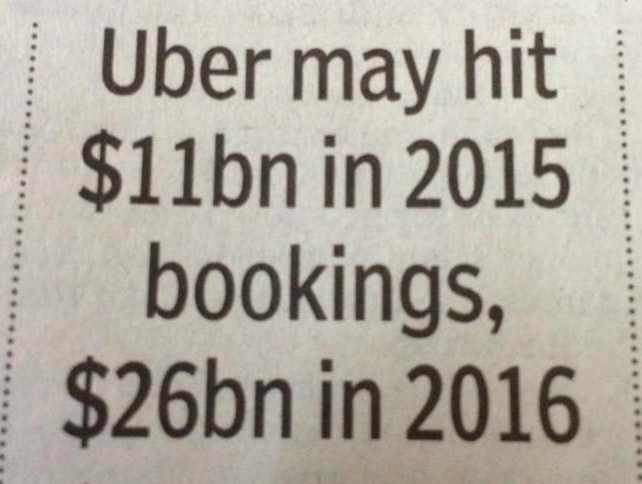 Till the point of time that this happens, there is only investment, and no revenues. Someone needs to fund the entire effort. Of course, the conviction in such cases usually is, that once done, the product that has been made, can be a rip-roaring success, making it worthwhile to have invested the time and the money. But the big risk in a model of this kind is that, while one is building it out, there could be someone else also doing the exact same thing. And that they could go to market say, a few months before you are ready. And steal the thunder and the market. OR in this period while you are building out, some fundamental inflexion point occurs, that puts the entire business model at risk. And that after, a lot of investment has already gone into building it out. The alternative to this model of course, is something that requires lesser development time and effort, can get to market sooner, can perhaps be made in phases, so that first phase product is out, getting tested, getting validated, and perhaps earning revenues too. In a sense, there is some amount of de-risking that takes place, in the process. The fact is that we NEED businesses with an R&D base, we need businesses that may have a long development cycle because only then, will the interesting product get born. But the validation of the model, the technology or the idea must be really strong, to justify the long time and money investment, before the product sees the light of the day. Most importantly, the entrepreneur working on this project needs an attitude that sees such a long term vision. That sees the day-to-day progress, works with the timeline of the end delivery, keeps costs under control, and yet, is relentless in pursuit of the dream, of the big picture. Notwithstanding the fact that there are no revenues and that money is getting sunk into the project, each passing day, and the fruits will come, one day. Hopefully. Only people with the right attitude of this kind, can nurture business models of this type. Another scenario that this attitudinal difference can be seen is in running businesses, with a particular kind of revenue model. There are some businesses where the revenue cycle is dependent on just a few large transactions happening in the course of the year. Say, a revenue cycle dependent on winning 3-4 large tenders in a year. In such cases, there is immense effort at the pre-sales level, often a matter of several months, in working towards a favourable closure of these revenue opportunities. And at the end of the year, getting say, 4 such deals, is a winning situation. Getting 2 deals may be break-even, getting a 3rd may mean nominal profits, and the 4th generating the large profit opportunity that the business is working towards. For all the efforts put in the pre-sales activity, it is quite possible that ultimately, the sale does not close in your favour. WIth a binary situation of a yes or a no, in each of these large revenue opportunities, it can easily happen that there was a bad year, and one ended up with only one success. How vulnerable is this model?! Then again, if you are in a business of this kind, you have no choice. Many others though might prefer, a constant trickle into their cash boxes rather than the few big-bangs. Whether you as an entrepreneur opt for one or the other business model again depends completely on your attitude. If you are working on the 3-4 large deals to happen in the year, can you maintain the confidence that you will get those, that you are able to fund your regular expenses even while you wait for those big deals? Can you keep investing the efforts without any sense of panic around “what if these deals don’t come in?”? That kind of attitude is required to support the business model dependent on a few large deals. If on the other hand, you need to see the ringing of the cash box, to get comfort that ‘all is well’, you are better served doing a business model that generates regular cash, and not just the big bang large deals. It would be a gross misfit if you were to attempt a business that gets few large deals and no cash is generated rest of the year. There is every chance that you will end up with panic very soon. This analogy extends to the individual too. After all, the individual is akin to a proprietary business of sorts, isn’t it? Especially if you consider the professional, someone who bills for his time, on projects. Here again, there are different kinds of professionals. Some like practising doctors or fashion designers or interior decorators, who have a “running business” and an accompanying regular inflow of revenues. And then there could be others like film actors say (not the very top notch ones who are working three shifts, but the second notch and below ones), who work when they get a project. Sometimes they sign on a film, which has to go to the sets in 6 months, and the earnings will really start after that. And for some reason, that start gets delayed. Or one is just waiting for the right project. Which takes time to come in. And in the meanwhile, there is not much to do. So again the question comes, “what if the projects do not come at all?”, “what if the project I signed up, and committed my dates to, gets delayed, and I don’t earn till it starts?”. If one is susceptible to such insecurities, then this kind of a professional career is certainly not for that person. On the other hand, if one has adjusted to this kind of uncertainties, has prepared for the same, and has enough confidence that some or the other project WILL come by, and the incoming revenues will keep happening, that person is well suited for a career of this type. So considering this blog is focused to startups and for startup entrepreneurs, the thought to consider is an examination of your personal attitude on these fronts. Can you work for a big prize, wait it out for a longer duration for the same, be confident and comfortable in the waiting period, be focused to keep working towards the goal, then and only then, should you opt for a business model of that kind. Else what you need is something that can go to market fast, start generating revenues fast, and keep funding your cash flows, as well as soothing your nerves!! Rediff.com does it again: wants to ape the next new shiny thing.. ! Why do they do this?? I have said this before and I say it again. Because I have seen this before and I see this YET AGAIN! Rediff.com always wants to be LIKE someone else. And mostly like the best new thing that has happened out there, and is already established and famous. And THEN, Rediff.com will come with its version of the same thing! 2. Ebay became big and Rediff invested in their own auction business, an Ebay look alike. Rediff wanted to be India’s Ebay then..
3. The Rediff.com interface was clustered like Yahoo’s or Indiatimes’. And then Google came along and showed what a clean, uncluttered interface can be like. And yes, we saw Rediff turning over into a clean and simple interface. No matter the fact that, where Google was fundamentally ONE big thing, viz. search, and it could offer that in a clean and simple screen, Rediff in fact, was a portal. And a portal needs to show more of its links and cater to users with different kinds of needs. But then, Rediff wanted to be a Google that time! 4. Then came Facebook time. And after Facebook had probably gone past 300 mn user base or so, and was already the default, Rediff came up with their look-alike social network. Again Rediff now wanted to be a Facebook..
Once more, too little, too late. 5. And now they have done it one more time. In the space of daily deals and group buying, where perhaps, there are 32 players already, and the big daddy of the world, Groupon having come into India too, Rediff now wants people to do their deals on Rediff. 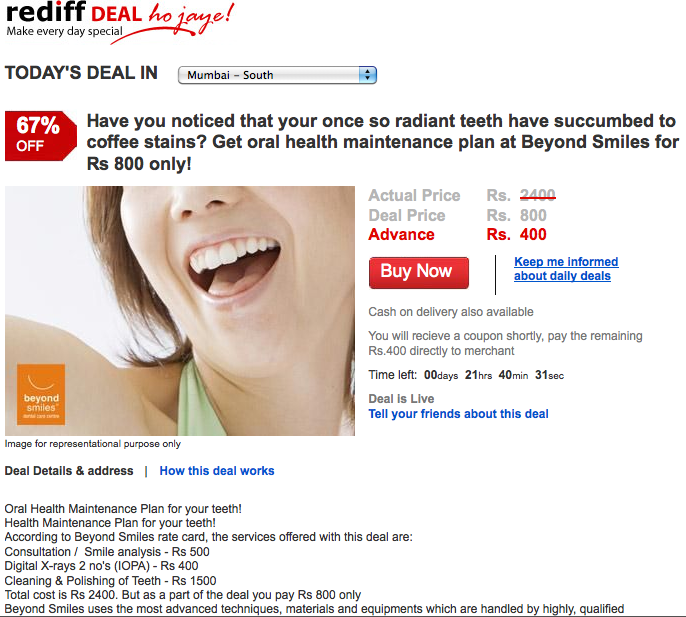 So Rediff now wants to be a Groupon!! More than anything else, I feel sad. 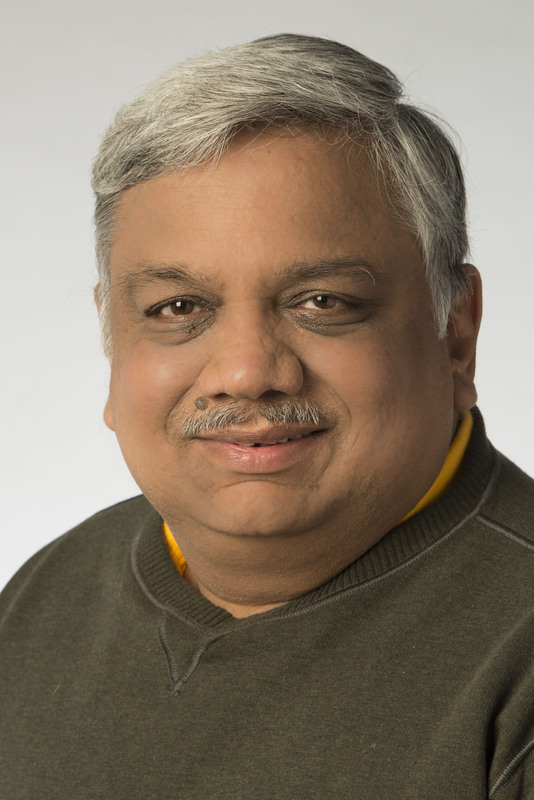 Rediff.com really had a great opportunity, it was first off the blocks in India, it had a great start, it got the Nasdaq IPO (that’s the only reason its been able to hang on, by the way – the cash in the bank!) in time. It could have been India’s most prolific and default dot com address. And yet, it chose to be a Yahoo, an Ebay, an Amazon, a Google, a Facebook and now a Groupon.. It NEVER tried to be a Rediff.com of its own!! What do you think? Any alternate views?? Why One More of the Same Thing? I come across startups at variety of forums, like TiE, Mentor Edge, and also directly, when people reach out to me. And it beats me as to how many times, I keep coming across the same (well, similar) business idea! I am not referring to two entrepreneurs, coincidentally working on the same brilliant idea. I am referring to entrepreneurs working on an idea, where there are multiple dominant players already in place. Like the 35th Group Buying business. Ok, irrespective of my personal feelings about Group Buying (and which you can read in this blog, across more than one posts), assuming that it will be a successful model, what is the different thing you want to do, where as a 35th entrant, you still expect to come out successful / leader?? In the world, there may be examples to prove ANY theory. So one would try and justify their entry by saying that wasn’t Google a late entrant in the search engine market, and did it still not come out on top? Just the same way, people like to quote Apple as an example in many different arguments (“Apple does not do much of its own Social Media – the users create the buzz for it. Can we also expect that?” for example). It needs to be understood that Google or Apple or their business models or their marketing strategies have been exceptions rather than the rule. Also that, fundamentally, both (and others of their kind) have a phenomenal product behind them, and even if they were to not do anything, maybe people would queue up outside their doors, with their cheque books open, looking to purchase! So first of all, every entrepreneur must not think that he is a Google in the making. Without trying to reduce any ambition or aspiration of the entrepreneur, it is necessary to have feet on the ground, while planning the business strategy, and the positioning. So while I have seen a bunch of Group Buying plans that did not differentiate from the many existing ones (at least in my mind), recently I came across another business model, that was similar to at least 4 other existing players. All 4 are reasonably well established, and this was the 5th one, entering the same space. Basically a content vertical, largely ad dependent for revenues, significantly demanding to maintain (at least for good quality). The entrepreneur was trying to show me the differences that he had made in his model, vs the other prevalent ones. Even though he may be right, in pointing those out, to me (and I’d be like a typical consumer for his content), I could not spot those differences, without his explanation. And for a content heavy site, a typical user is not going to run over it, with a microscope to see those differences. Why then, would a consumer change habit and come and read content here, instead of the others which he was familiar with? I was not able to see it. And I told the entrepreneur in as less discouraging a tone, as I possibly could. Of course, entrepreneurs are optimistic, if anything. All of us are. We want to give it our best shot, we feel we have the way to make this happen, we reckon that all things being the same, WE are that difference! So I am sure he is going on with it, and my best wishes to him too. And in a few years, he could have gone past the incumbents and emerged number 1. Again, I would only wish the best for him. But my point is for one who is planning a business. Where do you start? Do you look for existing successes, and want to try and do one of the same kind? Or you come up with something entirely new, something different, something that the world has not seen just yet?? But which you recognize, would have value? It is often easier to look at existing successes, and which is perhaps the reason why we see more me-toos, than original ideas. It takes a different vision, a certain imagination, creativity, and then a significant dare, to get into path breaking new thoughts, new ideas, new businesses. And which is why these are rare. I urge entrepreneurs to look to being different, being unique. More than being clones. Especially in an online business. In an offline business, due to various factors, including geographical relevance, many brands of the same business model, can survive. Perhaps be successful too. Online, everyone’s just a click away. There is no compelling reason (like geography) that a user will land to your site, even when there is a better site, more known, more popular, already around! Have we found a serious second auction site, after Ebay? NO!! Because Ebay is a click away. Why would anyone go anywhere else?! Think about it.. being different can be more challenging, but can also be more rewarding! What is your reaction when you see a physical product offered at an unbelievable low price?? Like a two-wheeler at 50% of its price? Or a TV at 40% of its selling price? Or even gold – at 30% discount??! My own first reaction (tampered as it is by standard thought process on gross margins available, etc.) is that it cannot happen! Or that maybe it’s a scam. It is not the real thing. It is second-hand. It is fake gold, etc. etc. etc. And then you look deeper. And get a bigger understanding of the process. Every advertiser is looking for that eternal ROI. How many crores spent on making the VW Vento ad speak to Times of India readers? How many increased walk-ins to the showrooms? How many cars sold? And calculations of that kind! – you spend money on expensive advertising (hoarding, print, TV etc.)? So that, essentially is the model for group buying! Divert the money out of advertising. Put the same budget in offering exciting discounts. Use the group buying vehicle to reach the customers who want your product. There.. the ROI is in for the budget allocated. But.. is it really that simple? If its not that new mousetrap, but rather the unbelievably cheap mousetrap, there are good chances that you’d have a queue outside your door, and you can sell as much as you want. Did you advertise only to reach those few buyers who would walk-in or purchase? If that was your intention, then some means of targeted direct marketing / telemarketing would have been better options, than mass media advertising, right? Your purpose of advertising was to also reach those were not going to walk-in today or purchase in the near future. People who may still register your brand somewhere in their heads, and think about you, as and when they get to a point of purchasing your product category. Or to create a general brand hype / visibility etc. Just cutting to the chase and getting those 40 walk-ins, gives you ROI, but does it give you that visibility at all? Will the buyer perceive that maybe your product is actually worth 50% of your selling price, and the rest of your normal mark up, is your huge profit. And which you should not be earning, really? Could that actually cause more harm than good, in the long run? Also where do you create your market for tomorrow? If you have not pushed the brand out as much, and have resorted largely to the short cut, discount driven, group buying options, the rest of the world has not been impacted by your brand. And you have left tomorrow’s market open for your competitor to lap up?! At a time when brand managers are pushed to deliver ROI and a group buying option appears to get them there, there will be temptation to pick it up. And sell at less than cost, by explaining the difference to the marketing budget account. But I wonder if this is sustainable in the long run. So is all group buying bad for brands? Certainly not. Where you have perishable inventory, group buying is a beauty. Airline seats, hotel room nights, even food products approaching ‘best by’ dates. Better sold at cheap than not sold at all. And good for the buyers too. Perfect win-win. Or for categories like services. Where each new service customer is not draining away real cost, but only utilizing the excess capacity that is anyway, idle. Theatre seats, saloon chairs, gym memberships are the examples I refer here. What I have concern about, are physical product areas, where attempts are made to sell cheaper than cost price – by a lot – and which can over time, potentially do more harm than good, to the concerned brands. What do you think? Love to read alternate opinions on this.. please comment below!